Once the competition began, following the opening ceremonies, it turned out that the news media were not so much covering the Olympics competition as mainly covering a few sports in particular and offering results of the rest. Indeed, just three sports made up 58% of all the news coverage of the Games. The sport that dominated above all others was one that attracts virtually no attention outside of the Olympics. Swimming and diving accounted in the first week of the games for fully 38% of all Olympic coverage. 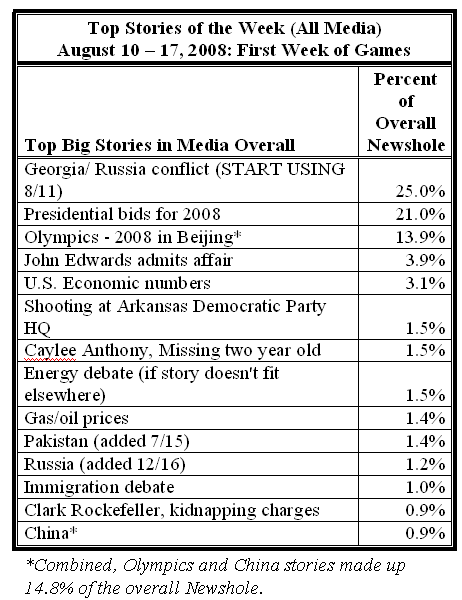 Swimming and diving alone, indeed, filled 6% of the entire newshole for the week, more than the John Edwards affair (4%) or the U.S. economy (3%). This, indeed, was more than three times the coverage of the each of next biggest contests, gymnastics (11%) and track and field (10%). After these three sports, no other specific sport attracted even 2% of the Olympics newshole the first week of competition. Even profiles of gymnasts, often the darlings of the Summer Games, registered just 0.3% of the Olympic coverage. Even these numbers are in way misleading. For it was not so much the sport of swimming as a single swimmer—Michael Phelps—who was the focus of the coverage. Fully 27% of all Olympic stories studied—better than one in four—were primarily about Phelps, U.S. star swimmer who became the first person to win eight gold medals in a single Olympics. Phelps was many lengths ahead of any other athlete in attention. The next most-covered athlete was gymnast Nastia Liukin, a Russian-born, American-raised Texan who won the gold medal in the all-around competition and would ultimately take five medals, making her the second-most decorated female American gymnast in a single Olympics in history. Phelps attracted nearly seven times the amount of coverage of Liukin (4%) the first week of competition. Indeed, Phelps’ story so dominated the coverage that the third-most covered athlete in the first week was not even there and not even competing. It was Mark Spitz, the swimmer whose 36-year-old seven-gold-medal record Phelps was breaking. 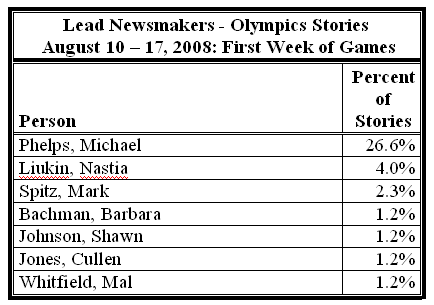 Phelps also received nine times the attention of all other male swimmers combined in the first week: Fellow swimmers Ryan Lochte, Jason Lezak, Cullen Jones and the U.S. Men’s Swim Team as a whole were all a lead newsmakers in a combined total of just 3% of all Olympics stories. ABC’s World News Tonight ran a story on August 13 that called Phelps’ talent ‘mystifying,” and analyzed detailed qualities of the swimmer including his stroke, body, strength, and even diet. The piece noted that the he world had become “fascinated” with Phelps with even the Chinese marveled at his accomplishments.